The original house on this site played the role of the quintessential 70s Connecticut house in the movie The Ice Storm. Extensive remodeling transformed a modest residence into something more formal, if still typically “New England,” in character. The master plan for the 18-acre property focused on the adaptation and re-use of existing elements. These included buildings (pool house, barn, guest house); athletic facilities (tennis court, paddle tennis court, swimming pool); and landscape features (retaining walls, specimen trees.) A few old apple trees suggested what was once an orchard, so more than 20 new apple trees were planted. The wetlands on the property were restored. A well-kept sports lawn was enhanced by surrounding it with a wildflower meadow. In the renovated house, virtually all of the ground-floor rooms open to the outdoors. The design challenge was to connect the house to the outdoors at all these points, and then to connect these points with the landscape elements, both new and old. This was accomplished through a series of intersecting axes delineated with paving and planting. 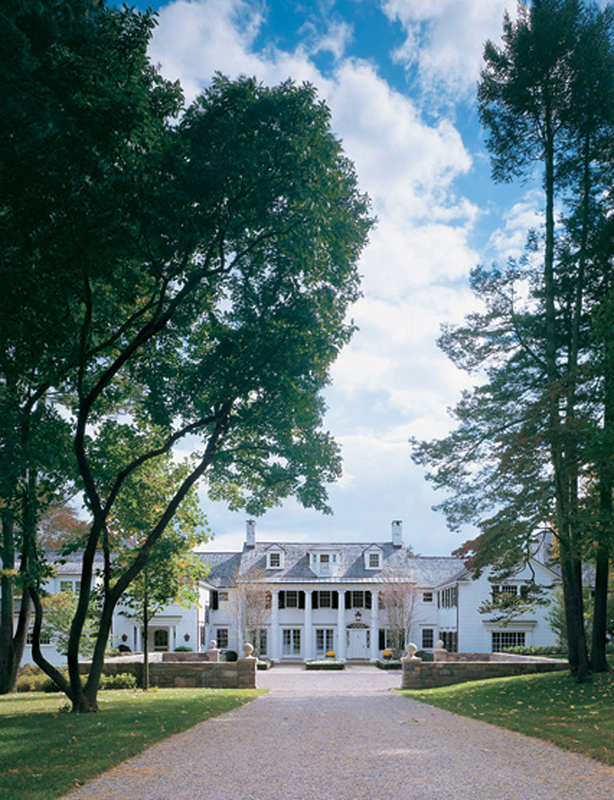 At the rear, a long, narrow “bowling green” lawn locates the building at a level above the great lawn terrace. A long, linear hedge, walk, and wall bounds the other side of the lawn while also transitioning to a re-created belvedere overlooking the pool and property beyond. The gardens surrounding the pool and cabana are, like those at the main house, leveled by means of wall work. The transitions in grade, although less severe, are equally dramatic, creating spaces of serene detachment.